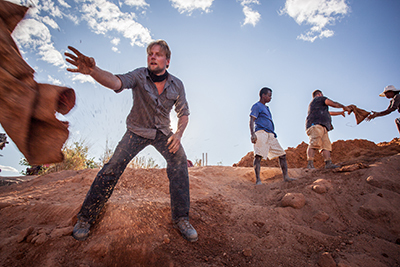 After graduating from SD Mines in 2013, Alumnus Fred Schilplin can now be seen on television leading an international motley crew exploring for precious stones in hand-dug artisan mines scattered throughout the world as part of National Geographic’s “Mine Hunters,” a new weekly documentary-style reality show that has taken Schilplin and company to six continents in six months. It has been amazing. We put ourselves in some precarious situations. These are not highly populated areas, so the risk factor is always a lot higher than it might otherwise be. But it’s a big and interesting world out there, and there is a lot to see. Alumnus Fred Schilplin was a non-traditional student at South Dakota School of Mines & Technology, so it’s only natural that his professional career path would follow suit. After graduating in 2013, Schilplin worked as a production engineer at the Wharf Gold Mine in Lead. But these days the 38-year-old father of four can be seen on television leading an international motley crew exploring for precious stones in hand-dug artisan mines scattered throughout the world. “Mine Hunters,” a new weekly documentary-style reality show on the National Geographic Channel, so far has taken Schilplin and company to six continents in six months. His mining engineering degree plays a big role on the show, and Schilplin is referred to as “the brains.” Rounding out the on-site crew are an underground miner, a blaster/panner and a mechanic from America, Australia and the United Kingdom. Their mission each week is organized, mostly from afar, by Guy Clutterbuck, a renowned international gemologist from the United Kingdom who uses his leads to get permissions from families or small groups to assist locals at their artisan mines. “It’s exactly what you’d think old-time miners were doing here in the Black Hills with their hand picks and shovels,” Schilplin says. The show’s premise is for the miners to find at least enough gems to resell to pay for their next adventure. “We are definitely on a budget and we sleep wherever we can. We are looking for all sorts of gems, basically everything but diamonds. Essentially, we fund our way to get to these places, finding gems to make money to go on to the next one,” says Schilplin, a Spearfish resident who has been back in the states since late fall. The show initially filmed eight episodes, and crew members are eagerly awaiting ratings to see what the future holds. Episodes that have aired or have been announced thus far are “Colombian Emeralds” (Jan. 19), “Seven Sapphires” (Jan. 26), “Blood Red Rubies” (Feb. 2), “King Sapphire” (Feb. 9), “Dynamite Garnet” (Feb. 16) and “African Aquamarine” (Feb. 23). The crew has mined in Madagascar, Colombia, Sri Lanka and Greenland, among other places. Schilplin credits SD Mines – one of just 14 universities in the United States offering a mining engineering degree – for preparing him for a versatile career and connecting him with this new opportunity. The mining department had been contacted by a production company from England looking for a recent gold mining engineer. Multiple Skype interviews and an on-camera video interview in Rapid City eventually led to Schilplin’s new international gem-hunting adventures. Far from fancy hotels and studio luxuries, Schilplin has slept in tents, hostels, even under the stars in Africa. The inherent dangers of mining don’t disappear just because the television cameras are filming. The miners’ efforts are real, and not everything is a success. In just one episode alone, a mine wall caved in due to excess water, the group’s vehicle was stolen, and Schilplin experienced a loss of oxygen and difficulty breathing after being hoisted about 30-35 feet below the earth’s surface into a hole the diameter of a garbage can. “It really does speak to all the different opportunities and areas that you could go into,” Mining Department head Lance Roberts, Ph.D., says of career options that can range from managing an active large-scale mine to research that ensures mine wall stability to construction of underground laboratories. Mine Hunters airs Tuesday evenings at 8 p.m. Mountain Standard Time on the National Geographic Channel. Check your local listings for the exact channel. Clips and full episodes may be found online at National Geographic Channel or on YouTube. View National Geographic promotional photos.